Dr. Fliedner investigates the molecular and cell biological characteristics of neuroendocrine malignancies, mainly focusing on paragangliomas. Paragangliomas are catecholamine-producing tumors of the sympathetic nervous system, including the adrenal-derived pheochromocytomas. Most frequently, paraganglioma patients suffer from symptoms related to catecholamine excess, such as hypertension, tachycardia, headaches, sweating, or panic attacks. Tumor removal cures all symptoms, however complete resection may not be possible, once metastases are present. Currently, therapeutic options for malignant disease are limited and the five-year survival rate is 55%. Thus, identification of new therapeutic targets and new diagnostic tools for early recognition of the disease are urgently needed. In order to detect characteristic expression patterns for better disease stratification and identification of novel therapeutic strategies, Dr. Fliedner performed protein-, gene- and metabolite-profiling studies, involving biological samples of human paraganglioma patients with different genotypes as well as in-vitro models. Dr. Fliedner’s current projects focus on oncogenic consequences of imbalances in energy metabolites. 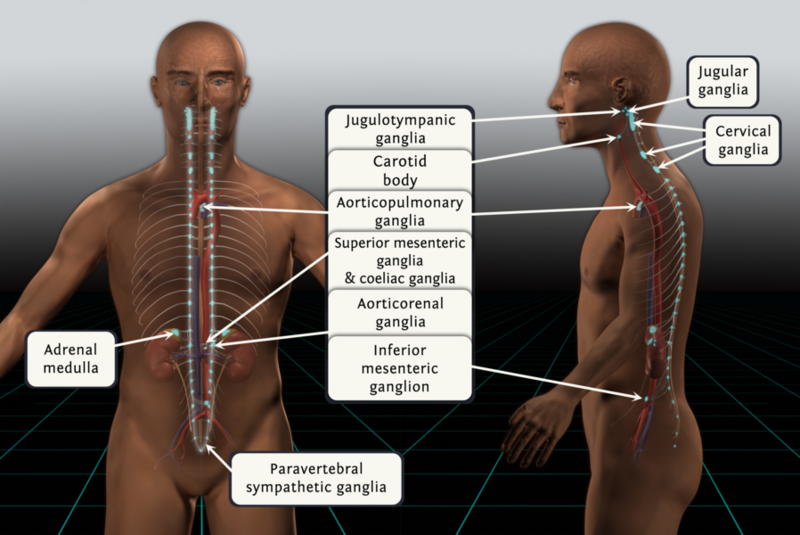 Paragangliomas can develop from any of the highlighted sympathetic and parasympathtetic ganglia, including the adrenals. Created by T. Mrozek and S. Fliedner. A 3-D animation of common tumor locations can be found here.